Karl Schmidt was born in Worcester, Massachusetts on 11 January 1890 and began drawing and painting when quite young. After graduating from Worcester Polytechnic Institute, he traveled to England where he studied art and painted land- and seascapes of Cornwall and the coast of Brittany. While in England he probably came under the influence of the arts and crafts painter Frank Brangwyn and, in turn, Japanese art through Brangwyn’s association with Yoshijiro Urushibara. Schmidt returned to the US and was a resident of Boston and Worcester until 1915 when he moved to Santa Barbara, California where he was associated with the group of painters who worked in California artist Alexander Harmer’s mission-style studio. In California, Schmidt expanded a decorative painting style in which he abstracted landscape forms, rendering them as flat planes of color thoughtfully arranged within his compositions. 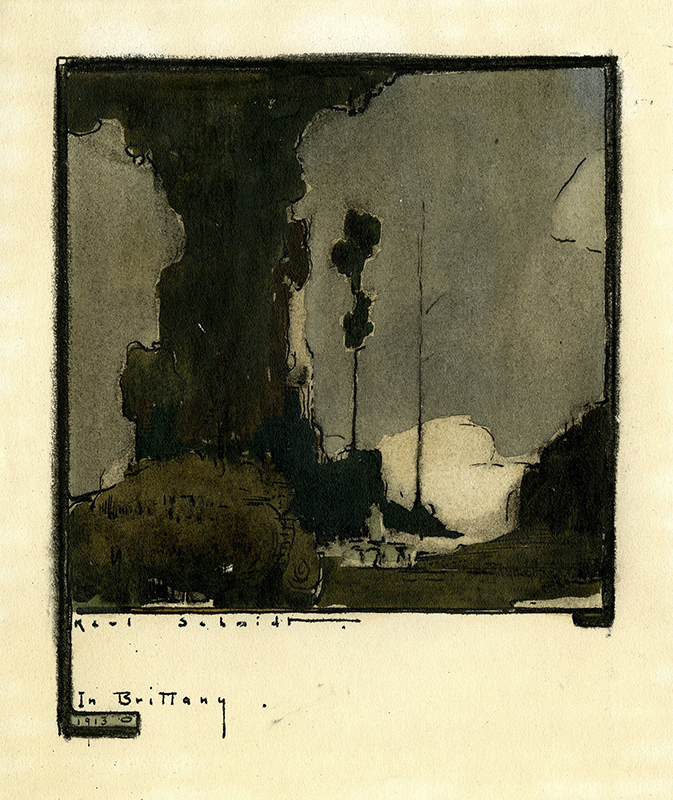 His approach suggests the influence of the art of Arthur Wesley Dow, whose method was disseminated by the many Dow students who settled in the Los Angeles area in the early twentieth century. In 1918 he joined the Navy and served in the Bureau of Aeronautics. He later pioneered construction of lighter-than-air craft and rose to the rank of commander. Karl Schmidt died in Los Gatos, near San Jose, California on Sept. 26, 1962. By agincourtiowa in Landscapes & Livestock, Uncategorized on Monday/30/July/2018 .